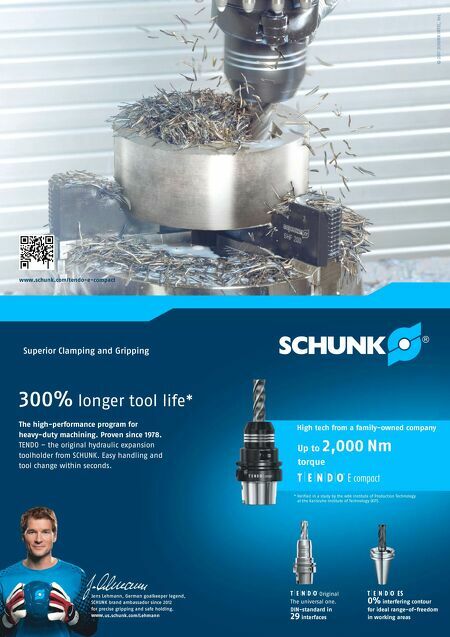 98 MMS December 2017 mmsonline.com BETTER PRODUCTION Shops Using Technology M.R. 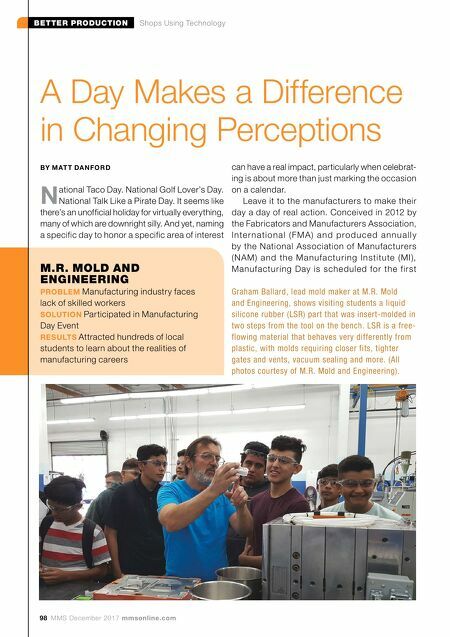 MOLD AND ENGINEERING PROBLEM Manufacturing industry faces lack of skilled workers SOLUTION Participated in Manufacturing Day Event RESULTS Attracted hundreds of local students to learn about the realities of manufacturing careers BY M AT T DA N FO R D N ational Taco Day. National Golf Lover's Day. National Talk Like a Pirate Day. It seems like there's an unofficial holiday for virtually everything, many of which are downright silly. And yet, naming a specific day to honor a specific area of interest A Day Makes a Difference in Changing Perceptions can have a real impact, particularly when celebrat- ing is about more than just marking the occasion on a calendar. Leave it to the manufacturers to make their day a day of real action. Conceived in 2012 by the Fabricators and Manufacturers Association, I n te r n a ti o n a l ( F M A ) a n d p ro d u c e d a n n u a l l y by the National Association of Manufacturers (N A M) a n d th e M a nu fac tu r in g Insti tu te (MI), Manufacturing Day is scheduled for the f irst Graham Ballard, lead mold maker at M.R. Mold and Engineering, shows visiting students a liquid silicone rubber (LSR) part that was insert-molded in two steps from the tool on the bench. LSR is a free- flowing material that behaves very differently from plastic, with molds requiring closer fits, tighter gates and vents, vacuum sealing and more. (All photos courtesy of M.R. Mold and Engineering).